In case you’ve been hibernating and missed it, something absolutely phenomenal has been happening with Lithium batteries in the last several years. The performance and weight have been increasing by leaps and bounds driven by the power tool, laptop and electric car industries. The 18650 cell formats have gotten incredibly stable and the energy density has increased every year while the prices continue to drop at a rate exceeding the predictions of most experts. If you’re into electric powered vehicles, it’s an exciting time to be alive. I got a 52v NCRb shark pack from Lunacycle.com (located here) about a month ago and was very impressed with their performance compared with LifePo4 batteries that I bought just one year ago and paid quite a bit more for and were twice as heavy. When you start looking at the performance capabilities of these new 2015 cells compared to older cells you realize that the transformation that is happening in Lithium Battery power is similar to the transformation of computing power we’ve seen in our lifetimes. For whatever reason the mainstream public is completely ignorant to what is happening and the fault may lie with the fact that the 18650 cells look a whole lot like the crappy Alkalines that we all grew up with, but their capabilities don’t even come close. Why do so few people see the potential of these amazing cells? Imagine how much longer this stupid damn bunny could go with some quality 18650 cells? How about over 4080 times as long (with some charging breaks in between). 18650 cells are clearly divided into two distinctly different groups, one group provides the maximum power density at the expense of peak current, the second group goes for peak current while not being overly concerned about maximum power density. The NCRb is an incredible cell that is often overlooked because of it’s low peak current capabilities, but at 3400Ma of power storage it is a very cutting edge cell. These numbers are impressive, but when you start looking at the peak power output capabilities of a high current cell like the 25R that is when the numbers really start to make your head roll. 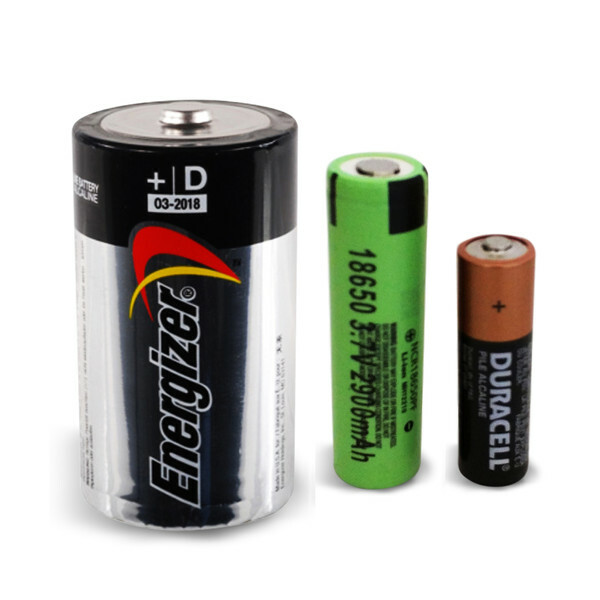 A normal Alkaline AA battery can put out about 1 Amp at 1.5v for a whopping 1.5 watts of power. 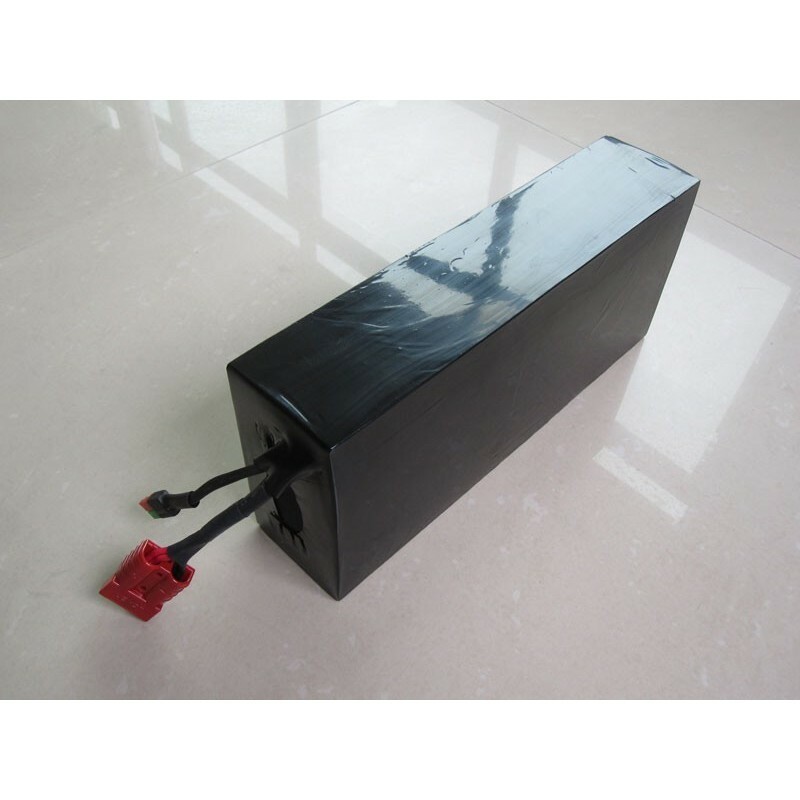 Some high power cells like the 25R cells can put out 100 Amps burst rate at 3.6 volts for a whopping 360 watts of power. That is 240 times the power output of the same cells that you grew up with, and they are rechargeable to boot. The 52v NCRb Shark Packs are glued together as there was not enough room for the plastic block connectors. The 48v Shark Packs have the plastic end block connectors which are a little bit better for cooling. So the million dollar question that our society should be asking itself is why the heck are we still using Alkalines for anything at all? The biggest factor is cost, your Alkaline batteries are about 1/10th the cost of cell if you look at the initial cost of the cell. This all breaks down when you look at the LIFECYCLE cost of the cell which for the Alkaline is $.50 for 3Wh or $0.16 a Wh. For the NCRb with 1000 cycles, you are looking at a life cycle cost of $0.00053 a Wh (not including the electricity cost to charge it). That means that for the same power capabilities Alkalines are over 300 times as expensive even though they cost 1/10 of the initial cost of a 18650 cell. This discrepancy makes it blatantly obvious that if we REALLY cared about the environment maybe we’d find some way to stop using these stupid alkaline batteries that we have to throw out after one charge and start figuring out how to integrate these 18650 cells into electronic stuff other than just power tools, laptops and ebike batteries. In order to use 18650 cells, the device has to be designed to use these cells as they have a different voltage and are more sensitive to shorting and over-charging issues (meaning they can blow up in your face if you’re stupid with them). To say that the new NCRb shark pack is the best battery I have ever owned would be an understatement. 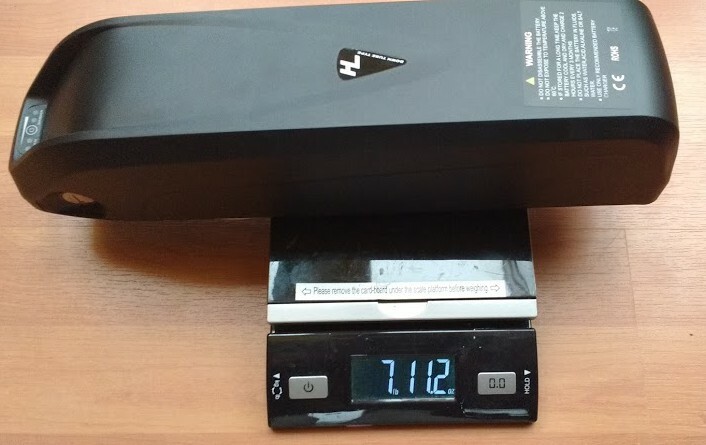 Just over a year ago I bought a 48v pack from BMS Battery in China for about $400 (without a charger) that was 12Ah Headway cells and weighed in at over 16 lbs. The battery is still listed on their website here ($381 for the 50Amp BMS w/out a charger) as weighing only 6kg, which is a total outright lie. I’ve told them TWICE that the battery actually weighs 7.5kg but they have yet to change the website. This is what you get when you try to deal with China. I spent well over $100 to get the battery shipped to me so in the end it was a crappy deal. I only use this example as a way to explore the weight to cost to power ratio for 2 different packs. So this means that I paid about 18% less for a battery that had 13% more capacity but only half the weight. Let that sink in for a minute, an 18% cost savings over the span of a year would be phenomenal enough on its own, but to have weight savings of 46% is absolutely insane. Initially, I went with the heavier LifePo4 chemistry last year because I didn’t want my house to burn down, but now 18650 cells have reached the point where they are stable and reliable enough with the proper BMS to not be a serious risk to your property. The first real 52v 13.5Ah pack I have seen that is light enough to consider mounting to your singletrack trail machine. So what were the real downsides to this pack? I’ve been beating on this pack non-stop for weeks now and the one complaint I have about it is that it does not work well at higher power levels. If you are running this pack with a BBSHD or something else that is going to pull 30Amps continuous then I can say with some certainty that you will probably not like how hot this pack gets after long climbs. There are plenty of disclaimers in the description and if you want a high power pack then you need to opt for the high power ‘pf’ cells instead. The cost is the same but you will lose about 2Ah off the pack. Such is life. With the BBS02 750W drive unit this pack really shines. Since the BBS02 never pulls more than 25Amps the pack barely gets very warm even with extended hill climbing and full throttle riding. Heat and lithium batteries do not mix, and if your pack is getting hot when using it then you need to get a bigger pack to meet your power needs or you will shorten the life of the pack that you are using. There really is just no way to get around this. This is the antiquated LifePo4 pack that I bought last year. I only got it because it had a 50Amp cont BMS which used to be hard to find. Goodbye, 50Amp Anderson Power Pole. Hello, XT 90 with Spark Arrestors. 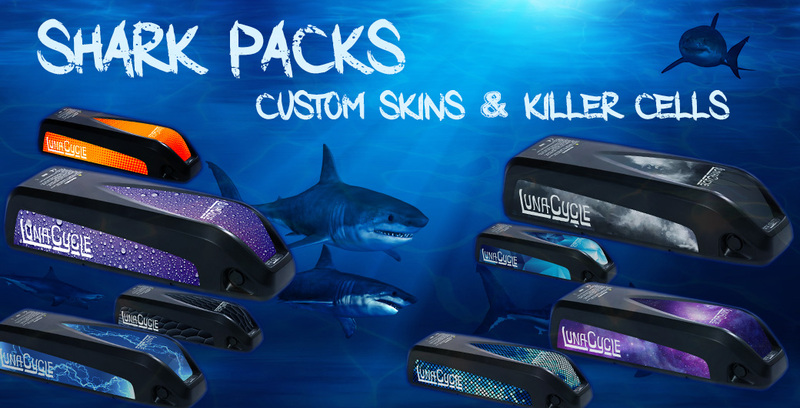 Should I get the 48v or the 52v Shark Pack? You are asking the wrong guy here. I like the gut wrenching wheelie popping feeling of a super low geared BBS02 and a 52v pack with a full charge of 58v. To me, the 48v packs always seem terribly anemic with any gearing setup. If you don’t care about having fun then go with a 48v pack, but if you are a fun hog like I am then don’t even consider ever buying anything other than a 52v pack. The Shark Pack comes with a 3amp charger but I strongly recommend just using the 52v Lunagizer as since my last cheap ebay Chinese charger blew up, I really don’t trust anything else. 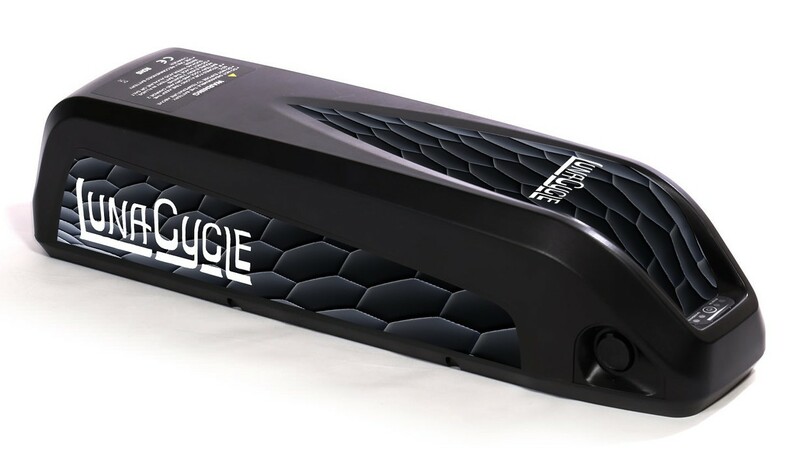 You can add a Lunagizer for $79 when you buy a battery pack, which is way cheaper than what it’s gonna cost you when your house burns to the ground because of a cheap Chinese charger. The future looks very bright for 18650 cells. 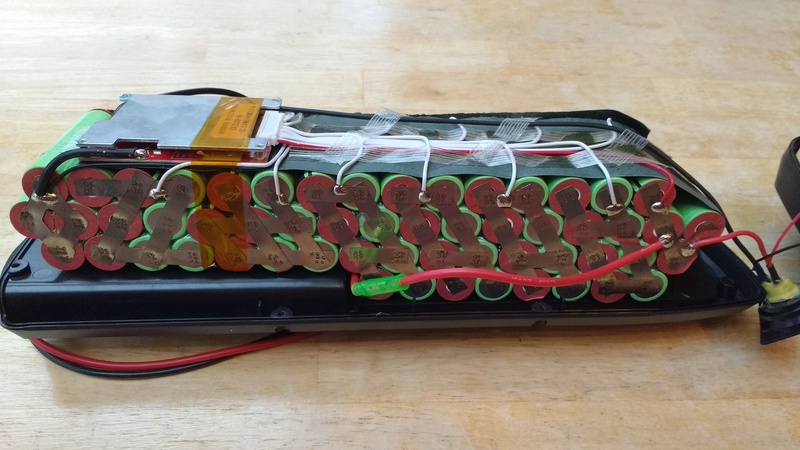 If you’re still using the older reliable LifePo4 chemistry or the uber-sketchy Hobby King Lipo chemistry it might be high time that you gave the 18650 cells a run for their money. I can assure you with some certainty that they won’t disappoint. The chief enthusiasts for the 18650 cells seem to be ‘vapers’. Maybe not the best group. There was an interview with Don Di Costanzo of Pedego a year ago. He said the only person who expected battery prices to come down was Elon Musk. I’m surprised someone selling 8,000 ebikes would be that far off the mark. It just sort of unfolded last year. Last Spring Sondors, in China, shifted from a Chinese cell to Samsung cells. He was offering a spare pack under $200. Of course, he was buying 400,000 cells, which must help. Still, you could see where the thing was going. Then Luna bought the very best cells and made packs that broke the price structure. But there are a lot of expensive packs out there. Get one of these packs that reflect the changes. Get a BBS02 or a MAC or a Golden, something nice that will get you up your hills. Find a frame that matches your cruise speeds. Do that and you have a bike with everything you should want in a bike. Mainstream bike. So what about shipping? As your earlier post explained, large capacity packs can’t go legally by air. I’m in Fairbanks,AK – is it economical to ship small quantities of 18650’s and assemble them into a useable, reliable 13-20 Ah battery? And as they age out, is it economical to break down a battery, test and save the good cells, recycle the bad ones, and rebuild? You can ship air, it’s just insanely expensive. The cells I bought from China didn’t ship ground. I’m doing an article on battery repair and building in the next month I hope. I would just buy a prebuilt pack. An article on battery repair? Your devoted legions await with baited breath. Just had a fairly young no-name 48V dolphin pack drop out me on the ride home yesterday. Thankfully mostly flat 5 miles remaining but: fat balding old boy + heavy e-bike with full commuter bag = buying my cardiologist a ticket to Hawaii. Was pretty jazzed to finish it feeling strong though — just at lower average speed. Need a backup anyway so it’s off to Eric at Luna for a fresh one but this is a repair project I’m looking fwd to. Karl, what’s the weight of the dock part of the battery, the one that attaches to the frame? Another great article. Thanks. However, I think you’re comparing apples to oranges regarding your comparison of Alkaline AA batteries vs. NCRb 18650 Lithium cells. You can get rechargeable AA cells that would have been more of an apples to apples comparison. What kind of real world range did you get with the 13.5ah 52v battery pack with the BBS02? I was thinking about getting it to do a 21 mile one-way commute year-round. This would include cold Minnesota winters and I was curious if it would be able to get me through 21 miles at 0F. Thanks! With normal temps and using PAS only you should be able to pull it off with PAS level 5 or so. With cold weather like that you’re going to need more power. Backpack batteries stay much warmer than frame packs, esp if you zip it closed. I would get a 20Ah pack just to be safe. That will also allow you to use PAS level 9. I got one of these and have found one thing that I definitely do NOT like about it. There is no ON-OFF switch other than unplugging the battery. I was under the mistaken impression that the key switch turned it on and off … it simply inserts a pin in the mount to key the battery from being slid off. This is not big deal if your motor controller has a soft switch but unfortunately my mine does not. Second irritating feature is the LED capacity cage. One has to hold the switch down in the middle of the display to light up the LEDs. I have small hands and fingers but even I have a problem seeing which LEDs are lit with my finger or thumb over some of them … poor design.